The truth is, the majority of people who are “artists” have a limited ability to reach into their visual memory and draw an object. Instead, we rely on using models, still lifes, photos, or even Google image search to base our art on. When it comes to sketchnotes, bullet journalling, and classroom doodles, these resources aren’t often available. To compensate for a lack of visuals present or available in the classroom, I’ve fallen back on a technique used by graphic recorders who create live graphics for events and speakers. Graphic recorders are constantly building what is called a “visual vocabulary”. A visual vocabulary is much like a language vocabulary – it’s a series of simple images and symbols, relevant to your context, that you are able to pull up on demand so that you can draw something without needing a visual model. In a similar way to how students of a new language may have a few basic words memorized but need to consult a dictionary for difficult or rare words, your visual vocabulary helps you have a ready image you know how to draw for common illustrations. In this series, I’m going to be demonstrating some of my visual vocabulary for psychology related topics. Psychology can be difficult to represent visually, by definition it is abstract concepts and feelings which don’t necessarily correlate to concrete images. 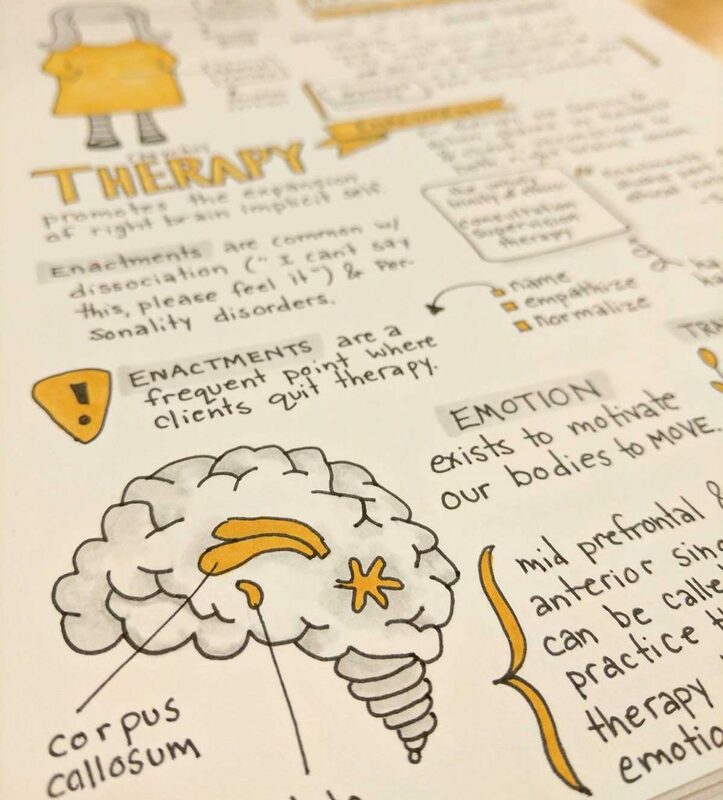 By creating a visual vocabulary of psychology related things – like brains, images that represent relationships between people, and images that represent emotions – I can begin to use and adapt these images in my psychology related sketch notes. As the field of psychology is constantly in communication with, and adapting alongside, neurobiology, images of brains are relevant to my notes in almost any psychology class. For the first few years, I seem to always draw brains a little differently each time, sometimes more like clouds than brains, I needed to develop a way to have a more standardized brain with the signature shape and angle and texture of the brain. Follow along for my step-by-step instructions or how I quickly add a brain model to my sketch notes. The first step is- and this is off but effective so bear with me- to think about (or even pencil–sketch) a coonskin cap. I don’t know why, but this visual really helps me get the right shape for a doodle brain and helps me avoid the odd cloud–shaped brain that often lands on my page when I don’t use this visual. Atop the coonskin hat, draw a cloud shape. Be sure that the back of the cloud is lower than the front of the cloud, and not there is a slight upward curve from the lower base to the upper base. On the lower side of the cloud two thirds of the way back, draw a brain stem. I do this by stacking rectangles that are slightly progressively smaller in size. After adding the brain stem, you should begin to see a brain-like image developing. Erase any pencil lines from the hat-doodle, if you added any. I find this pattern to be the best at creating brain texture – just remember to randomize the pattern. Once your brain looks fully wrinkled, add a bit of depth by a adding shading. Using a Copic N0 or a darker pink than your fill color, shade one side of each wrinkle. Once shadows are added, adding the fill color later will help blend the shading. After the fill has been added you can add a field to the brain stem and your brain doodle is finished! These basic steps, repeated over and over, can help concretize these steps into your visual vocabulary until soon you will be able to quickly doodle a perfect brain on the page without much thought. Despite how culture tends to view art and artists, practice is a huge part of growing artistic ability. Adding this image to your visual vocabulary will help increase your skill at adding cute doodles to your notes or illustrations.